The Culver Bulldogs baseball team and new head coach Joey Graves traveled to St. Paul to open their season with a doubleheader on March 14. Culver was trying to make some in-game adjustments, but fell short in a 14-4 loss and a 7-3 loss. The Bulldogs have been indoors every single practice to start the season so far and had a slow start to their first game in a 14-4 loss to the Buckaroos. All of their runs came near the end of the game. "It was great to get outside," head coach Joey Graves said. "Traveling out to some nice weather. This was our first day outside, since we have been in the gym these last two weeks. There are definitely some things that we saw, that need to be worked on, but it is very hard to do that in the gym, like reading fly balls and seeing live pitching, pitching from the mound. Those type of things." "We just have not had the opportunity to practice those things," he said. "It was just nice to go outside and really see where we are at." Culver became more comfortable as the game continued, adjusting to their first look at live pitching and outfield play for the first time. "Game one, there was a bit of struggle there," he said. "Kids were trying to make the right adjustments to pitching versus me throwing to them in a cage or off a pitching machine. It is a different thing for sure. Defensively, we played pretty good accept for reading some fly balls. We did have some errors in the outfield, but infield play was pretty solid." "We scored in the late innings, linking some good hits together," Graves said. "They had an errors that we scored some runs on. It just came a little too late in the game. We are trying to work on getting started early and not just turning on in the late innings." Anthony Hood finished the first game 2-for-3 with an RBI. Tadd Anderon went 1-for-3 with an RBI double. Culver showed their improvement and comfortability in the second game, hitting the ball much better, but still could not get by St. Paul. 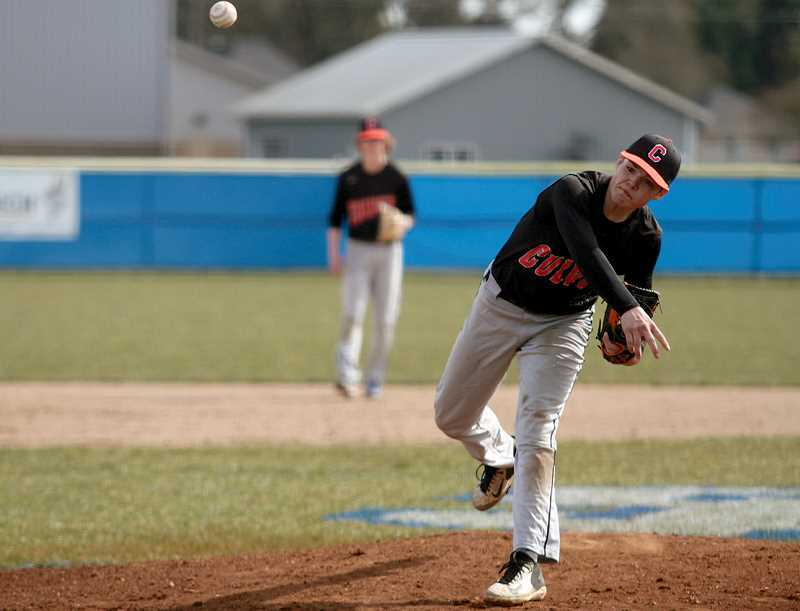 "Tadd (Anderson) started for us on the mound, threw a lot of strikes and looked really good," said Graves. "We hit the ball better in game two. I think we just started to settle in; we might have been a little nervous in the first game and were able to get those first game jitters out of the way. Game two was just a lot cleaner. We played a lot better for sure." "I liked our overall confidence," he said. "Kids were up in the dugout, cheering for the team, staying positive. I would really just like to work starting right from the first inning and keep that momentum rolling." Cord Gomes recorded an RBI double and Joe Russo hit an RBI single. Culver starts the season 0-2, while St. Paul improved to 3-0.The Bulldogs will travel to The Dalles to play Dufur on Wednesday and are scheduled to play in the Madras White Buffalo spring break tournament March 28-30.